The recent cancellations of train service in and out of the Xinjiang region are fueling conjecture about the fate of local Uyghurs who are locked up in concentration camps set up there by the Chinese regime. Xinjiang’s railway department will stop selling train tickets leaving and arriving in Xinjiang, as well as for local train service within the region, beginning on Oct. 22, China’s state-run Urumqi Evening News reported on Sept. 27. The cancellation was due to train operation adjustment, the railway department said; there was no indication from the department as to when normal operations would resume. The service cancellation has subsequently been confirmed by Hong Kong media Apple Daily on Oct. 1, when tickets for trains from the southern Chinese city of Shenzhen to Urumqi, the capital of Xinjiang, were no longer on sale for trips after Oct. 22. 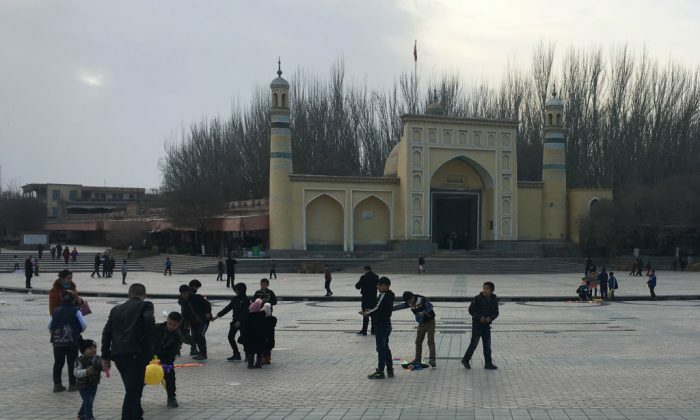 While Beijing has yet to provide an explanation, many have speculated that the railway is shutting down because Chinese authorities are moving Uyghurs being held inside concentration camps in Xinjiang to different parts of the country. The southwestern region is home to many Uyghurs, an ethnic minority in China, who have been subject to a brutal crackdown by Beijing in recent years. On Sept. 21, the Chinese-language Epoch Times received confirmation from a source in Xinjiang that local police officers have signed a confidentiality agreement not to reveal that they are transporting Uyghurs elsewhere. According to the source, about 1,500 Uyghurs in the area where he resides were being sent to other locations. On Sep. 25, Radio Free Asia reported that more than 100 special police officers secretly transferred more than 3,000 Uyghurs via more than 50 buses out of camps in Xinyuan County, located in the southeast of Urumqi. The transport took place while the entire county was under “traffic control,” according to the report. Three days later, on Sept. 28, RFA received confirmation from a police officer in Bulakesuxiang, a village in Shufu County, Xinjiang, that local police were transporting a group of Uyghurs locked up in local camps to other Chinese provinces. The police officer, who couldn’t confirm the exact number of Uyghurs being transported or their final destination, told RFA that they have been transporting Uyghurs since the beginning of last month. In August, a United Nations human-rights panel estimated that 1 million Uyghurs were currently being held in camps for political indoctrination inside Xinjiang. China has denied that the camps exist, despite satellite images that reveal massive encampments in the region. Gay McDougall, a member of the U.N. Committee on the Elimination of Racial Discrimination, said that Uyghurs—most of whom practice Islam—as well as other Muslim minorities in the area, were being treated as “enemies of the state,” due to their ethnoreligious identity. Beijing has labeled Uyghurs as a terror threat to justify the group’s suppression. In schools, students are forbidden from speaking the Uyghur language. Books on Uyghur religion, history, and culture have been burned. In their everyday lives, the people are subject to heavy surveillance, including numerous security checkpoints in public areas. Reports of Uyghurs being rounded up and placed in detention camps, where they often face inhumane treatment, first emerged last December. Three Uyghurs, who escaped to Turkey after being detained at such camps, spoke about their experience in a recent interview with RFA. They spoke on the condition of anonymity out of fear that family members still in Xinjiang might be subject to reprisals by Chinese authorities. These camps are for the purpose of “re-education,” where Uyghurs are indoctrinated with ideas of loyalty to the Chinese Communist Party, forbidden from using Islamic greetings, and required to learn Mandarin Chinese and sing Chinese propaganda songs that promote the Party. A male Uyghur said that detainees often face constant beatings while incarcerated.